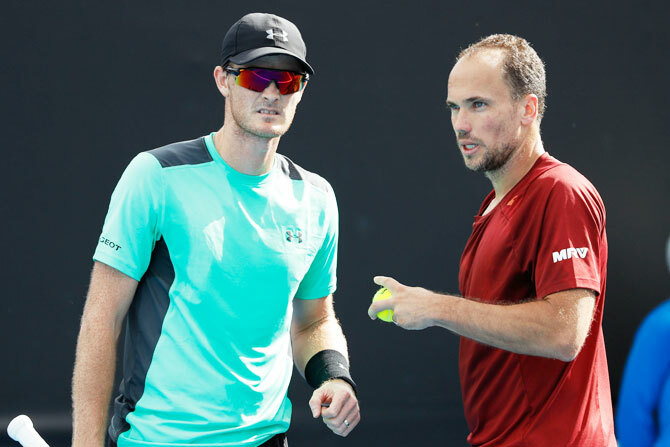 Top men's doubles player Jamie Murray has called for an end to the ATP Tour's scoring system in the format and says there is widespread support for it to be changed. While the grand slams have stuck to the best-of-three sets system, the men's tour uses a sudden-death point at deuce and has a tiebreak in place of a final set. The system was introduced in 2006 to help broadcast rights holders better plan their schedules. Murray, whose Australian Open title defence was ended in round one when he and Brazilian Bruno Soares lost to Americans Sam Querrey and Donald Young, said the players did not think much of the change. "It's nonsense, I think," said Murray, who reached the world number one doubles ranking last year. "When we come to grand slams we always feel like the best team wins. "They're not putting matches on centre court or on TV (in regular events), so just put us on the outside courts and let us play normal scoring." Chris Kermode, the executive chairman and president of the ATP Tour, said doubles was "a very important part" of the Tour and that the format change had been a success. "The changes to the format in 2006 were made ... ultimately with the aim of offering a fast-paced and innovative product which is easier to schedule on show courts, as well as facilitating participation for singles players," he said by email. "Looking back, I think you could argue that those changes have worked. Doubles has come to play an integral part in the overall success of our season-ending tournament, as well as providing our doubles players with an amazing showcase." Other leading doubles players believed the format allowed too much room for luck. "The difficulty is that the match can be decided on 10 good minutes from your opponent," said Raven Klaasen, the South African who was runner-up at the ATP finals in London last November. "I think all doubles players would like to have an opportunity where it doesn't feel so out of your control and that would be with a scoring system that allows a bit of time to breathe as the old system was." Klaasen added that the singles format could be next in the firing line. "I think down the line, singles will have the same issue," he said. "We need to predict the match is not going to be five hours, so it's more likely that the singles start talking about that than that doubles goes to a longer version." Soares said he believed all the top doubles players would vote to change it back to the same format used at the slams or to two full sets with normal scoring and a tiebreak, while former No. 1 Nenad Zimonjic said fairness was the main gripe. "Just the fact that you could be playing much better for say 80 percent of the match and then last five minutes you play bad and you end up losing, I don't think it's really fair," said the Serbian. "I think they could change it," he said. "They won't, but they could." Kermode said nothing was set in stone. "The scoring format is a popular topic of debate, not only in doubles but also in singles, and we'll continue to listen to our player members on any discussions moving forward," he said.